President Muhammadu Buhari has departed Abuja for London where he is scheduled to meet with his doctors for routine medical check up. 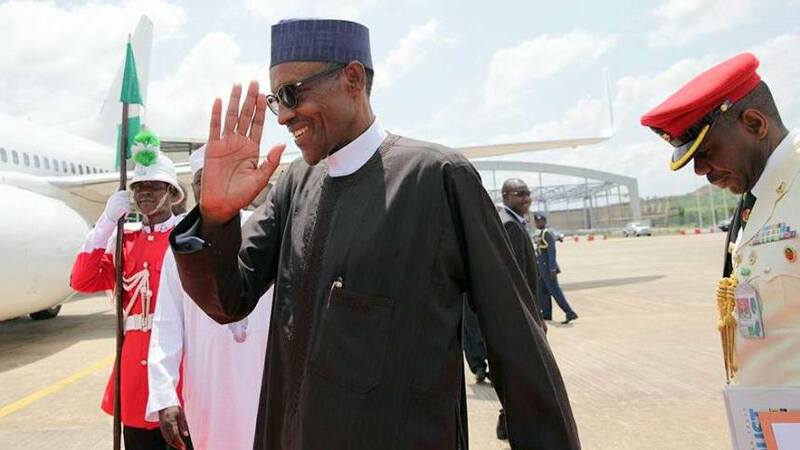 The presidential aircraft conveying the president and few of his aides took-off from the presidential wing of the Nnamdi Azikiwe International Airport Abuja at 3.20 p.m. The Minister of Federal Capital Territory, Alhaji Muhammad Bello, the Inspector-General of Police, Ibrahim Idris and Chief of Staff to the President, Malam Abba Kyari were among those at the airport to bid the president farewell. Others included members of the president’s media team Mr Femi Adesina, Malam Garba Shehu, as well as other presidential aides. Garba Shehu had on Monday in a statement said President Buhari would on Tuesday begin a four-day trip to the UK on medical check up. He said “in the course of the technical stop-over for aircraft maintenance in London on his way back from Washington last week, the president had a meeting with his doctor. Shehu added that the president, who would return on May 12, would undertake a two-day visit to Jigawa, which was postponed because of the All Progressives Congress’s Ward Congresses. President Buhari first went on medical vacation on Jan. 19, 2017 and returned later than he planned and declared that he had never felt so ill in his life. The president returned for treatment on May 7, 2017 and came back after 103 days. Before leaving Abuja on Tuesday, May 8, Buhari received Letters of Credence from ambassadors of Netherlands, Republic of Botswana and Lebanon to Nigeria, where he stressed the need for sustained financial, technical and capacity building from the international community to mitigate the effects of climate change in the country.